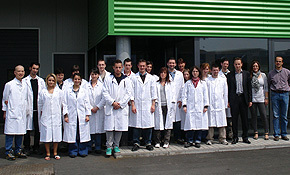 PCH devotes a large part of its research to the strawberry crops. All aspects of this crop are examined. 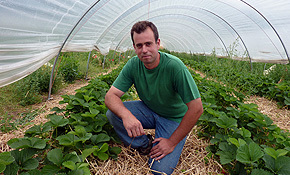 A major goal is to continuously improve the sustainability of the production of strawberries. Therefore, in respect to pest control, the PCH is resolutely turned towards IPM (Integrated pest management). 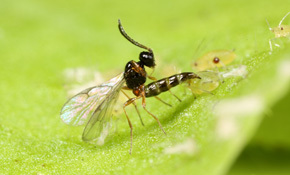 Against aphids, the mix of parasitoids FresaProtect, is used in different production systems. “Strawberry growers know they must keep aphid populations under control and therefore make intervention in time. The concept of a mix of parasitoids is in this context an interesting tool because it can be introduced preventively in the crop. Furthermore, with the mix of parasitoids, it is not necessary to identify the aphids, which makes biological control easier for the grower” says Tom Van Delm. 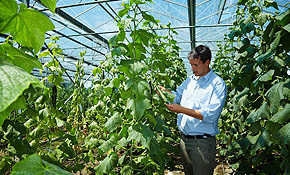 “A monitoring of aphid control is possible: by following the live aphids and mummies (parasitized aphids), we get a good assessment of the level of control. If it appears that the aphid population increases too quickly, despite the use of beneficials, it may be necessary to treat the pests chemically. In this case, the use of a compatible chemical insecticide is possible and/or new parasitoids may be reintroduced. It is also this flexibility, consistent with the philosophy of IPM, that I appreciate with the use of FresaProtect.” concludes Tom Van Delm.